Australia’s Largest range of solariums and tanning beds – 100% Legal to purchase. Plugs into any Australian Power Point. Delivery available Australia-Wide. Get The Best prices and the highest quality sunbeds in Australia. Check out our facebook and see why we are liked by over 10.5K people! Regardless of where you live, we’ll get your shiny new machine to your doorstep! It’s that simple! Our products are equipped with the latest green friendly ELECTRONIC ballasts. Basically this is the latest technology in the world and uses less than half the power of Magnetic ballasts. Our tanning beds are 100% legal in Australia, so you can have peace of mind. HTA solariums are built to run on normal 240v power points and a normal home power system. Everything about our products is designed to get you maximum results. We only use the best Globes in the world which is the most important component on any tanning bed! Are you ready to enjoy the benefits of a year-round tan from the comfort of your own home? 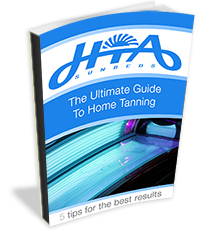 Find out the #1 mistake people make when purchasing a Solarium bed. Learn how to avoid a huge power bill. Find out how to dramatically extend the lifetime of the globes! We are here to help. Contact us now for any extra details or questions you may need in purchasing your perfect tanning bed.